It was a loaded week. Both angels and demons were at work. Just only a week of the return of Backlash, there was real reason, this time around, for another unceremonious exit. Before bedtime on Monday – and this is usually between midnight and 1.00am – I had dumped my two laptops (18-inch Dell windows and 13-inch Mac Book Pro) on the two-seater by the window. I have not seen them again. While asleep, a thief forced open the window, cut through the mosquito net and left with both items. The loss is enormous. I am not talking of the money cost of the two computers. I am talking of the real cost and only those who understand the composite relationship between a reporter and a computer can tell the real cost of losing a laptop loaded with data. The brand new Mac was a gift from a friend and still blank after its configuration. The Dell has a substantial portion of the history of my Backlash column. That also is not too important because all of my published articles are backed-up in The Guardian systems. The real issue is this. I have accepted invitation to present the keynote address at the annual conference of the Urhobo Progress Union (UPU) United States chapter, taking place in Detroit Michigan at the end of the month. Visa and ticket are ready. The speech to be delivered was in the works in the stolen Dell laptop. And so, what drove up my blood pressure when the reality of the loss dawned on me was not the money it would cost to replace the two computers, but the lost speech. I will not say more than this. That I am here on this page today after the ugly experience could qualify for one of the wonders of the modern world. ANYWAY, let’s go into the business of the day. Instead of a President, we now have Acting President in the person of Prof. Yemi Osinbajo. He used to be Vice President until some 11 days ago when the position of the President became vacant following the absence of President Muhammadu Buhari who went to London on a 10-day vacation. Prof. Osinbajo is a very experienced Acting President. In less than four years, he has been tested thrice in that capacity and found to be very effective. In one of the previous tests, he acted for a quarter of a year and 15 days when President Buhari, for reasons that had to do with his failing health, stayed outside the homeland for 105 days. By all descriptions, Prof. Osinbajo is therefore not a small boy in the acting business. But before I go any further, I would like to make the clarification that “acting” in this context is not the same as “acting” in the context of Nollywood, which is a make-believe business. I am talking of real acting, whereby the Acting President does real things. Last Tuesday, Acting President Yemi Osinbajo did one of such real things. He sacked the Director-general of the Department of State Services (DSS), Mallam Lawal Daura for allegedly mobilizing armed and masked men of the service to mount a blockade at the National Assembly Complex, thereby preventing legislators from gaining access to perform their constitutional duties. Daura was sacked just like that for an act that didn’t constitute an infraction of the law as at the time of commission. The crime was made retroactive and I think with a good lawyer, Daura can earn some reprieves. While we await that, for now, he has become an ordinary man with ordinary powers. In addition, Osinbajo was able to source a house, big and strong enough to contain Daura and stop him from circulating about dangerously. It is called house arrest in security language. Interpreted further, it means a whole Daura was actually arrested like any other offender by the Nigeria Police and placed in confinement. Perhaps, things changed pretty too fast for Daura to keep pace. Using his men to invade public institutions including Government Houses wasn’t an offence or even a crime before Buhari left for London on August 1, 2018. In 2015, his men invaded the Government House Uyo, and nothing happened. The following year, he stepped up his profile as an invader and invaded the houses of serving justices of the Supreme and High Courts in the middle of the night and nothing also happened. Thereafter, the DSS dished out salacious details of how huge sums of money in hard currency were recovered in the house of one of the raided justices, Adeniyi Ademola. Daura was hailed to high heavens as the man Nigeria needed to win the war against corruption. On the other side, it was a complete disorientation for the Judges who were used to upholding the innocence of accused persons until proven guilty in a court of competent jurisdiction. With Daura, the judges were declared guilty pending when they would be able to prove their innocence. Because corruption is Nigeria’s public enemy number one, any battle plan, conventional or unconventional, clean or dirty, deployed to kill it has a way of enjoying instant acclaim. So it was with the Daura battle plan against corrupt judges. When he called the judges thieves and raided their houses for stolen items, many Nigerians including Senior Advocates of Nigeria (SANs) were in the sidelines clapping and encouraging him to do more to salvage Nigeria from corruption. Prof. Itse Sagay (SAN), for instance, clapped and also said the FBI in America, the equivalent of Nigeria’s DSS, would do same in similar circumstances. Even Prof. Osinbajo, also an SAN, being Vice/Acting President, was not heard anywhere condemning the raid. He gave his tactical approval. The accusations were to be tested in court beyond the DSS razzmatazz and nothing stood firm. All the accused justices just walked away free from their trial into peaceful retirement. Meanwhile, buoyed by his marvelous approval rating, nothing ever got too big for Daura to take on. He had even challenged his chi to a fight when he blocked, not once but twice, Senate confirmation of President Buhari’s nominee, Mr. Ibrahim Magu, as the substantive chairman of the Economic and Financial Crimes Commission (EFCC). That is why till date, Magu has operated in acting capacity and has perhaps remained the longest acting chairman of any Federal Government agency in the history of public administration in Nigeria. The DSS under Daura was also fingered in the reinstatement and rehabilitation of the fugitive federal civil servant Abdulrasheed Maina, who was on the EFCC and Interpol wanted list for allegedly embezzling billions of pensioner money. What is even more surprising is the fact that Daura had not been queried before now for any wrongdoing. Therefore, to sack him for working his beat the way he understood it is injustice of the highest order. I do not need to be a professor of law to understand that basic fact. This is exactly why I am advising Daura to go to court to seek redress and I can assure him that Osinbajo being a professor of jurisprudence will obey any court order for his reinstatement as DG, DSS. It is not everybody in Nigeria that disobeys court orders. Somehow, Nigerians are happy with the sack of Daura by the Acting President and I can say that if the Acting President remains consistent with his act, citizens may work hard for his principal to remain in perpetual vacation.Church G.Os and mosque Imams will go into prayer and fasting sessions for the medical vacation in London to continue till May 29, 2019 at least. 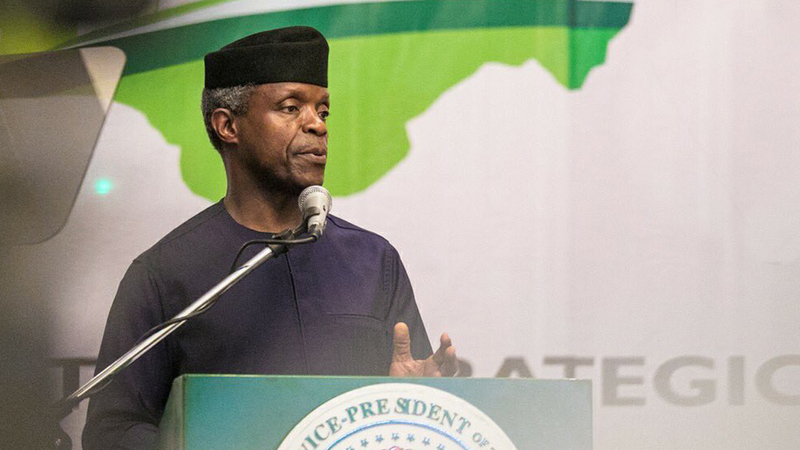 Either by design or accident, some of the tough fixes of this administration happened when Osinbajo transformed from Vice to Acting President. He, it was who stopped the merry-go-round in the judiciary and confirmed the appointment of Justice Walter Onnoghen as Chief Justice of Nigeria. I hear also that he was the one who dismissed from the Federal cabinet that fellow who spent N250m to cut grass in some IDP camps. I remember he told the International Oil Companies to relocate their headquarters to their areas of operations in the Niger Delta. Above all, Osinbajo engages to lessen acrimony in all situations. And anytime he is Acting President, there is usually a lull in herdsmen killings, geo-ethnic tensions and the executive/legislative face-off. The upsurge in tension returns when he also returns to being Vice President. Today, Nigerians are thanking him for sacking Daura. They are also saying that he can do a little more before he changes back to Vice President. What is today’s date? Time is of the essence here. President Buhari ought to have completed his 10-day vacation and returned yesterday. If there is extension as in past medical vacations, the Acting President, before he steps back, should use the extension window to quickly fix the Police and the EFCC, which have become tools for persecution of opposition politicians. He can also even up with the National Assembly, so that the chase to liquidate Saraki can end for good governance to resume till 2019.